Book a Golf Travel Package in Ireland and Enjoy the Trip! Book your Golf Travel Package in Ireland Now! 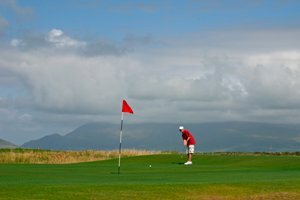 If you are a golfer, a golf travel package in Ireland may be the perfect way to combine your love of the sport with a tour of some of the most stunning scenery in Ireland. 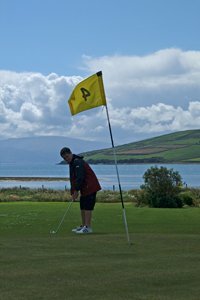 There are golf courses throughout Ireland, from the local pitch and putt to some of the most famous links in the world. I've visited a few golf courses in Ireland over the years. My son always wants to play golf in Ireland when we are vacationing. On one of our first trips to an Irish golf course in Tralee, he was about ten years old. As he played, it rained off and on throughout the round. I still remember him as he put his hood up over his head, got ready to swing, and declared, "Every day is a great day for golf!" As you plan your golf holiday in Ireland, you want to keep in mind that you will see all kinds of weather. You should pack for several different conditions, which may all occur within the same day. One minute it can be a sunny, gorgeous blue sky. The next time you look up, you see the clouds rolling in and a shower will start. High winds are not uncommon. Ireland golf courses are filled with hearty souls regardless of the rain, unless the lightning starts. So pack some warm sweaters and rain gear and have a wonderful Ireland golf vacation! There are many golf tour operators in Ireland. 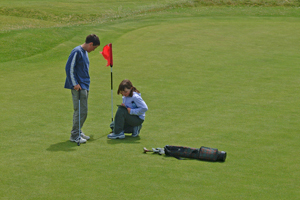 They will help you arrange your golf travel package in Ireland. Some Ireland golf packages include flights, hotels, meals and transportation to and from each golf course. Some Ireland golf trips are self-drive tours, allowing you the flexibility to wander off the path on your own. You may want to plan your golf travel package in Ireland by geographic region. Each region includes several choices. You will want to take in some of the other sites along with your golf rounds. Or maybe you won't! When you fly in to Shannon airport, you can start your golf break in Ireland at Dromoland Castle Hotel. This beautiful resort is close to the airport and provides you with one of the premier golf holidays in Ireland. The castle hotel is located at Newmarket-on-Fergus in County Clare. Your non-golfing companions will find many activities and comforts and probably won't want to leave for the next destination! 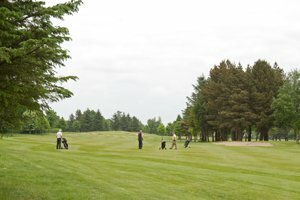 Ireland's Shannon Region provides two more golf courses you may want to include in your golf travel package in Ireland. They are both in the pretty town of Adare, in County Limerick. The Adare Manor Golf Course is next to the ruins of the Desmond Castle and the 13th century Franciscan Abbey. 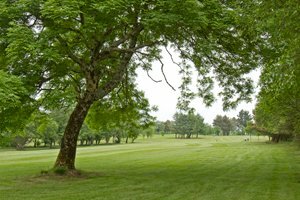 The Adare Golf Club is a parkland course designed by the world-famous Robert Trent Jones and is located at the estate of the Adare Manor Hotel in Adare, County Limerick. Galway Bay Golf and Country Club is a superb addition to your golf travel package in Ireland. Stunning scenery along the Atlantic Ocean gives you the Irish golf experience in a setting every traveler would appreciate. The golf course is six miles from Galway City and two miles from Oranmore. Another West Region golf course is Oughterard Golf Club in Gortreevagh, Oughterard, in County Galway. A new clubhouse, bar and restaurant make this beautiful course even more attractive. The Southwest Region provides the world-renowned Ballybunion Old Course, which has been ranked among the top courses in the world. My son was lucky enough to play the course as a teenager while my daughter and I took photographs along the Atlantic coastline and had a picnic on the beautiful beach. 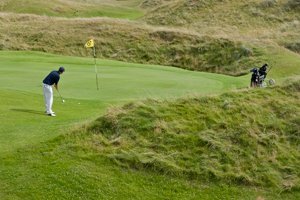 People from all over the world visit the Old Course and Ballybunion's Cashen Course, which is a long, difficult, and beautiful addition. Ballybunion is in County Kerry and 30 minutes north of Tralee. I hope your golf break in Ireland is enjoyable. You won't have time for all the courses; you may just have to return each year!